Kate and I got to bed late night before last. As a result, yesterday was a very short day. It was almost 1:00 before she got out of bed. She didn’t want to shower, so we were able to leave for lunch close to 2:00. I was afraid we might be looking at 2:30 or 3:00. As it was, we didn’t get back home until 3:30. I wasn’t surprised that she was tired. She took a nap in the family room while I checked email and watched a little football. We ate so late that I didn’t feel like eating much. We went to a nearby Mediterranean restaurant where I got a bowl of soup, and Kate had salmon over basmati rice. Her meal came with a salad that I ate. That leads me to make a comment about two changes in Kate’s eating habits since her diagnosis. The first is that she was known for her salads and desserts. Her mother was an outstanding cook, and Kate took after her until Alzheimer’s entered the picture. When our children were little, she was especially careful to prepare nutritional meals and snacks. As children Jesse and Kevin enjoyed her homemade yogurt, granola, bread, and whole wheat pizza crusts. She even made yogurt popsicles with orange juice for their snacks. After the children left for college, she and I started eating out more often. That was the beginning of a lessening of her interest in cooking. One of the things she kept up with was making very good salads. Since Alzheimer’s and her shift away from salads, I have missed those. She is now a “meat and potatoes” eater. I have learned to order her “Bacon Turkey Bravo” sandwich at Panera without bacon (too hard for her) and lettuce. I sometimes ask that they omit the tomatoes as well since she often doesn’t eat them. When we split meals at restaurants, servers often ask if we want them to split the salad or bring an extra salad. I always tell them to bring just one salad and give that one to me. My explanation for this change is that she has been guided for years by what she thought was nutritionally appropriate. 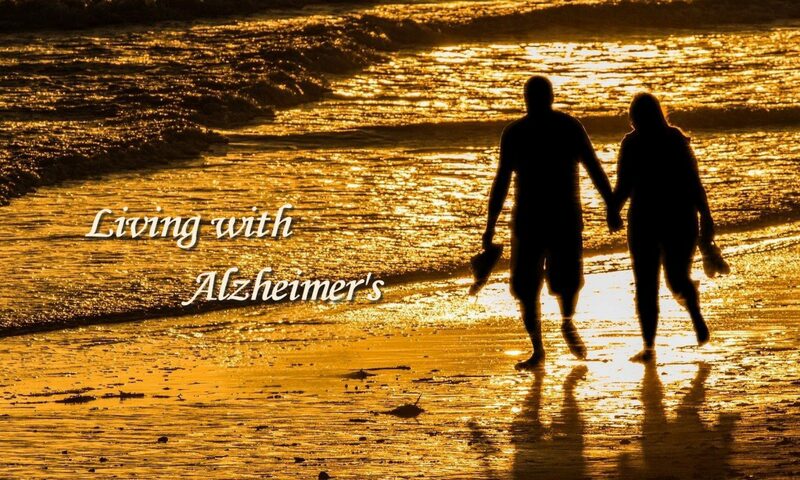 With Alzheimer’s she eats the things she likes without regard to any dietary or nutritional concerns. This is not unusual for people with dementia. For a long time broccoli was one vegetable she would eat, but that is just about gone now. It is not just taste that is relevant. She frowns at the mention of certain vegetable options at restaurants. I recently mentioned our having squash soup at two different restaurants. She didn’t like the idea. I got her to taste mine, and she liked it. One of the big surprises has been a change in her taste for Dr. Pepper, her favorite beverage after iced tea. Now she frequently comments that there is something wrong with it. When she asks me to taste it, it seems fine to me. I have taken advantage of this by often ordering tea for her just to avoid the calories. I still keep Dr. Pepper (8 oz. cans) at home. She often fails to finish one. That is not unique to Dr. Pepper. When she was drinking apple juice, she rarely finished one glass. Another change that has occurred involves her sense of hunger. I know from others that this is very common among people with dementia. It is not uncommon for her to ask, “When are we going to eat?” within an hour or so after a meal. Because she has so little memory, this is understandable; however, she often doesn’t feel too full after a very filling meal. This does not mean that she has lost her ability to feel full while eating. Sometimes she tells me she is full. Other times I can’t be sure whether she is full or didn’t like her meal. I make this point because we had a filling meal at lunch yesterday. She ate a lot of bread, her entrée (minus the spinach), and our eggnog cheesecake. We finished our meal about 3:00. At 5:00, I told her I didn’t feel hungry right then and would like to wait until 6:00 to leave for dinner. She was comfortable doing whatever I wanted but would have been happy to go at 5:00. Having slept late yesterday morning, did not affect Kate’s bedtime last night. She got in bed around 9:30. She was ready to go to sleep. It was not one of her talkative nights. When I got in bed a little later, she was still awake. I moved over close to her. She said something that made me think this was one of those times, she didn’t recognize me as her husband. Then she pushed me away. She often feels hot after she gets in bed. Most nights I move close to her when I get in the bed. I don’t usually remain that close for long because I get hot, and she gets hotter. (I’m talking body heat now. <g>) This made me ask if she was hot. She said, “Yes. That’s part of it.” I said, “What’s the other part?” She said, “I’m trying to think of how to tell you. Let’s talk about it tomorrow.” That’s quite a note on which to call it a day. I know she won’t remember this when she gets up this morning. I’ll never know what it was she was trying to think of how to tell me. I do know this. Within a few minutes, she moved closer and affectionately put her arm around me. I’ve spoken a lot about Kate’s sleeping late over the past few months, so I should let you know that she was up at 6:00 this morning. That itself is not unusual. She often gets up between 5:00 and 7:00 to go to the bathroom and then back to bed. Today was different. I saw her getting ready to shower. I told her what time it was and that she could go back to sleep if she wanted. She indicated she was ready to get up. I got her towels and clothes ready for her and left her. She was ready for Panera before 7:30. Being so early led to a humorous moment. About 9:00 (an hour and a half after our arrival), Kate gave me a look that I recognized as “I think it’s time to go.” We got things together and said goodbye to our Catholic friends. When we got outside, Kate said, “Now we can get some lunch.” I told her it would be a while before lunch and asked if she would like another muffin. She said she would. We turned around before getting into the car and took our place at the table we had just left. Our friends at the “Catholic table” chuckled and welcomed us back. They all know about Kate, and are very understanding. When we came back in, I set up Kate’s iPad while Kate went over to get a drink. I noticed that she was a little unsure about what to do and asked if she would like me to get her drink. She said she would. Then she asked me where I wanted her to sit. At that moment, we were standing beside our table with her iPad opened to her puzzle. She rarely sees it without my pointing it out to her. A little later we received a phone call from our daughter. That, of course, was a bright spot in our morning. Before going back to our table, Kate responded to a woman seated near us. It was someone whose husband had been a friend of my dad’s. Both of them died five years ago. It had been that long since we had seen her. We had a nice conversation with at her table. When we were through, Kate asked for my help in getting back to our table that is about 12-15 feet away. It is now 10:45. It looks like we will be here until we leave for lunch. I’m not sure about Kate, but it’s been a very nice morning for me. I think it’s been good for her. Although she doesn’t talk as much as I do, I think she benefits from the stimulation of being with people. All the encounters are pleasant ones as well. I think it’s good for both of us. This is a follow-up to my post yesterday morning about Kate’s eating habits. At dinner last night, something else occurred that I hadn’t mentioned. She likes a lot of Parmesan cheese on her pasta. She has been known to open the top on those ubiquitous glass containers with the metal top with holes in it and pour most, if not all, of the cheese on her pasta. There are two restaurants we visit regularly. They bring the cheese to the table in a small cup that looks like it would be about a third of a cup. When it is just the two of us, she puts all of it on her pasta though she often asks if I would like any. Knowing that she wants a lot, I always decline. Last night, we ate dinner at a new restaurant. Because of that we ordered two separate meals rather than split as we often do. Then came time for dessert. We took our server’s recommendation and got the hot donut holes covered with cinnamon sugar and accompanied by a small cup (about 1/3 of a cup) of a caramel sauce. I served Kate two of the donuts and took two for myself. She quickly took the cup with the sauce and poured the entire cup over her donuts. They were on a small plate. The amount of sauce almost spilled over the edges onto the table but not quite. As with the other things I mentioned in my previous post, these are inconsequential. They just make me wonder what may lie ahead. I know that some caregivers carry a small card with a message saying that their companion has Alzheimer’s and asks for understanding if they notice anything that seems strange or inappropriate. This is something that can be given to the server or anyone nearby who should be properly informed. I haven’t felt the need for a card like this, but it has crossed my mind. I do make it a point to let some people know about Kate’s diagnosis. All of our regular servers know. In addition, on a few occasions I have told a new server. That has usually occurred when I am waiting at our table for Kate to return from the restroom. I enlist their help in seeing that she easily gets back to the table. I also make sure the people at the spa where she gets her massages and facials know. The problem there is the changes in staff. When I see new people, I try to make sure they know. To some, this may seem unnecessary, but one time I returned to pick up Kate and found that she had left. The spa is located in a strip center. I found her walking along the sidewalk in front of one of the shops. She wouldn’t have known how to get back to the spa. She probably would have forgotten she had been at the spa. You can’t be too careful. I have learned that lesson although it took several mistakes on my part. Eating Out: How Long Will It Last? This journal has been filled with experiences Kate and I have had when we eat out. I believe it has been of major therapeutic value to both of us. Sometimes I wonder how long we will be able to do this. I know there will be a time when it will be more challenging to take Kate out so much. I am hoping that is a long way off. As I watched Kate eat a hamburger at lunch yesterday, I thought about something else that could be another problem in the long run. Previously, I have mentioned that when she eats a sandwich, she often takes off the top slice of bread or bun, picks through the various items that were between the slices, and eats them with her hands. I have stopped ordering anything with lettuce or bacon on it. She almost never eats them. I don’t understand about the lettuce, but she doesn’t like crisp things. That rules out the bacon. She may or may not eat any slices of tomato. After taking off the top of her hamburger bun yesterday, she picked up the rest of the burger and took a bite. A couple of minutes later, she picked up the hamburger patty itself and ate it. Then she ate most of the bottom and top of the bun. When she finished, she had eaten almost all of the burger, bun, and contents. That is unusual. When she eats a sandwich at Panera, she picks out bits and pieces and leaves a messy looking plate. She doesn’t like the crust on bread and usually leaves it. Two of the restaurants where we eat regularly serve hot bread that she likes. It is more like rolls. That means there is a lot of crust. She pulls it apart and eats everything but the crust, leaving a pile of crust on her bread plate. Thus far, I haven’t found any of these things to be a problem. I think they are not even noticeable except to the servers who pick up our plates. Even they don’t normally watch her while she is eating. I believe she still sensitive about eating this way when we are with friends. At least, I haven’t noticed the same behavior when we are eating with them. Still, I can help wondering what might happen in the future. At the moment, I don’t plan to worry about it. Time will tell. Eating out has its challenges. Occasionally, someone asks how, or if, I am able to maintain a balanced, nutritional diet since we eat out for all our meals (lunch and dinner). The answer is I find it challenging. Kate and I are drawn to slightly different food items. That has led me to repeatedly visit restaurants where I know she and I will both be happy. She has a much stronger preference for carbs than I do. I don’t mean that I don’t like them. I do, but I attempt to control my diet by eating salads for most lunches and some dinners. Typically, I avoid bread except on Sunday when we eat at Andriana’s. I like their bread more than other places. We also share lots of meals. That helps a lot. For example, at the Bonefish Grill last night, we split an entrée of 4 grilled shrimp and 4 scallops. It came with a small house salad which I ate. For our sides, we got sautéed spinach and mashed sweet potatoes. I ate the spinach and Kate ate the sweet potatoes. This works pretty well for me. The big problem for us is desserts. We both love them. For a long time, however, we have only eaten dessert infrequently. The major exception is when we eat at Casa Bella. Their Amoretto cheese cake has been a favorite of ours for many years. We always split a piece when we are there. That was fine when we were just going there periodically. When they started their music nights, that meant eating there three times a month. More recently, we’ve started going to another small Italian restaurant that makes its own gelato. We eat there every Wednesday night. We’ve added a single scoop of it to our weekly routine. We’ve gone to Carla’s regularly for about a year. We eat lunch there on Tuesday. A few months ago, we discovered they also make their own gelato, and we love it. We now get one scoop of it each week, and it’s a little larger than the one we get on Wednesday nights. We’ve eaten at Andriana’s on Sundays the past three years or so. We had never had a dessert there until a few weeks ago. For some reason, our server asked if we would like dessert. She probably hadn’t done that since the first few times we had gone there. As I was about to say no, Kate said, “What do you have?” I knew it was all over then. It turns out they had a special that day, a banana pudding cake. It was a yellow cake with two thick layers of banana pudding and a heavy cream cheese icing. Since then we have had dessert two other times. I’m afraid this could be habit forming. Here’s the real dilemma for me. I could use my will power and skip the desserts; however, one of the pleasures of our marriage involves our sharing desserts. I don’t know how much longer this will last. In the meantime, I have opted to keep it going. I’ll have to figure another way to keep my weight down. A socially active day, and it’s not over. I knew this was going to be a full day, but it’s turned out to be more than I expected. That’s good news. We had a very nice lunch with Angela and Marvin Green who are members of our church. It was an unusually good social experience for Kate. Normally, when we are with another couple, almost all of the conversation is among the four of us. We had some of that today, but there were at least two times when Kate and Marvin were engaged in their own conversation while Angela and I did the same. Kate handled herself well and was quite talkative. I couldn’t help wondering how much of what she said was actually true, but it doesn’t matter. She was having a marvelous time. Angela asked what they could do for us. I told her that going out to eat together was the very best thing they could do. It really meant a lot. After we returned home, I received a phone call from another church friend. She and Kate became friends when Kate served as the volunteer church librarian. Martha wanted to know if she could drop by to visit with Kate. I told her that would be fine. When Martha arrived, I told them I was going to let them visit and went to the kitchen which doubles as my office. I couldn’t hear what they said, but they never skipped a beat in their conversation. I don’t know who was happier, Kate or I. It is a very rare event for Kate to have the opportunity for the kind of one-on-one conversation she had both at lunch and this afternoon. We are going to opera night at Casa Bella in little over an hour. That is always special, but I feel sure the two social experiences she has already had will be the highlight of this day. Eating out still works for us. Last night we ate at Bonefish Grill, a place we have frequented more often recently. During our meal, I didn’t see anyone that we knew which is a little unusual. As we got up to leave, we passed by a couple whom we have known through the Knoxville Symphony. We chatted with them a little bit. Then I noticed a hand waving to me from another table. It turned out to be a former neighbor and her husband. We hadn’t seen them in a while. We must have had a ten-minute conversation. After that we saw a fellow Rotarian and his wife whom we also see at some of the music nights at Casa Bella. We left having had a good meal and another social occasion. It didn’t require anything special on Kate’s part or mine, but it was the kind of thing that provides a little boost in the day. I am glad to say that we have many of these at meal times. While there are a lot of good things to be said about eating in one’s own home, in terms of our personal needs, eating out is just what the doctor ordered.